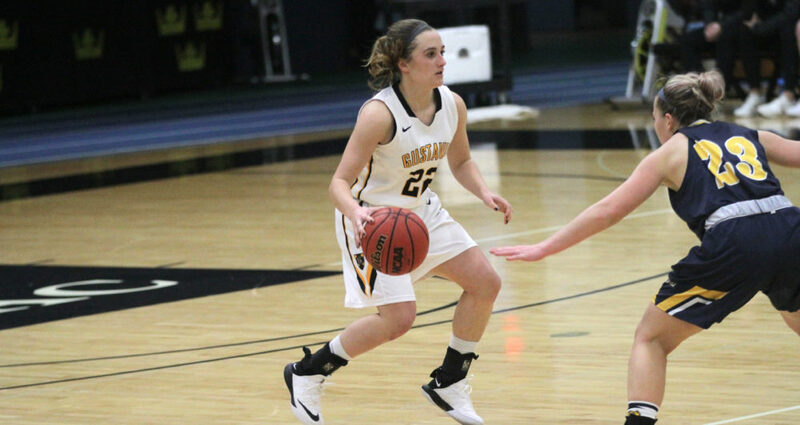 SAINT PETER, Minn. – The Gustavus women’s basketball team won its third straight game at home Tuesday night, defeating Buena Vista 78-49 to improve to 3-1 overall. The Gustie defense played well, forcing 33 turnovers and limiting the Beavers to 32.7 percent shooting. After a slow start with a five-point deficit, Gustavus called for a timeout and finished the first quarter strong on a 19-7 run. The Gusties carried a 36-24 lead into the locker room at halftime and continued to increase their lead throughout the second half. Gustavus scored 40 points off turnovers with 21 fast break points. Justine Lee (Sr., Dawson, Minn.) led all scorers with 21 points on 9-of-16 shooting. She also hauled in eight rebounds and made two steals. Kendall Thompson (Sr., Eden Prairie, Minn.) posted a double-double with 14 points and 10 rebounds. She added five steals, four assists, and two blocks. Ava Gonsorowski (So., Esko, Minn.) and Paige Richert (So., Comfrey, Minn.) also reached double figures with 11 and 10 points, respectively. Gustavus next travels to Luther for a 2 p.m. non-conference game Saturday.